The interesting thing to me, is it all started as a simple conversation at a casual dinner about a month ago. I was sitting with Steve and Marie and we were discussing how to promote the fashion show. The theme of the show is James Bond and entitled “For Your Eyes Only.” As we talked, I mentioned in jest that to pull this off you’ll need an Aston Martin, maybe a Lamborghini or other fast car, and of course an airplane. We left the dinner that night and I figured that she would come up with a graphic that would depict the event nicely. Marie had never seen many of the older Bond Films, but knew three things… she needed to find someone with an airplane, someone with an Aston Martin and a visually interesting place for the shoot. Within a week, she was on the phone and connecting at local events. Soon she had the cars lined up and just by accident happened to be talking with someone at an event who ran a flight school in San Diego and would be glad to provide a location and an airplane. Now the cogs were turning. Working out the technical details with Steve, she moved forward, set a date and location, and called up her fashion designers and models. Within days she had a poster created, the location secured, and a Facebook group to tie everyone together. I still can’t believe she pulled this off. It all came together in spectacular fashion last Saturday. Through this whole event, I learned three important lessons about connecting with people. You Have to Overcome Fear. If there is one thing I’ve learned from Marie, is that you have to talk with everyone that you meet, and not be afraid of asking people to do things. While many people will be busy, or have previous engagements, if the event is worthwhile, quite a few people will say yes. Marie is a master of this. Probably half of the men at this event were invited by Marie from different networking venues. She would just walk up and say… “You would make a great James Bond. 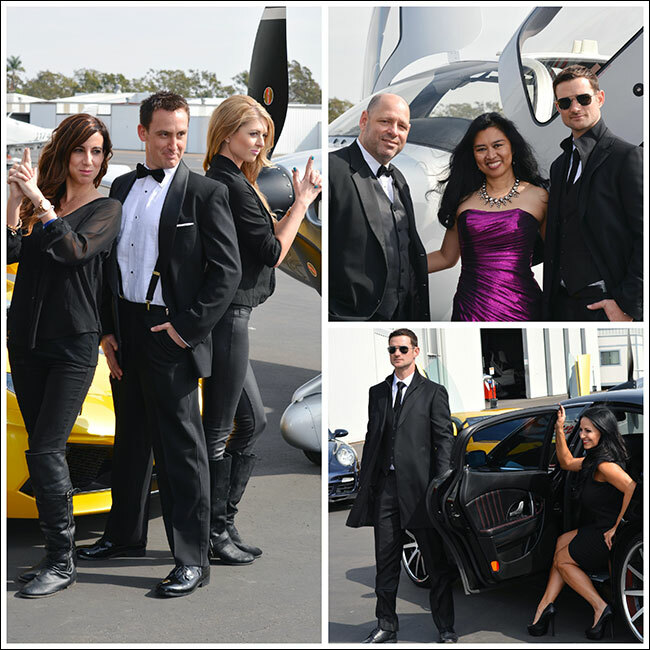 Would you like to be in a photo shoot.” Guys showed up from all over Southern California. A couple even flew in for the event. To make things happen, you have to ask. You May Not Get a Second Chance To Say Yes To An Opportunity. This can be a hard lesson to learn, and one that requires a lot of discernment. It’s easy to say no, or come up with excuses. During the photo shoot, there were opportunities for group shots. If you missed one, it probably wouldn’t be offered again. Many people were invited to the event that said no without learning more details, and just from the comments left on Facebook, were very sorry they had not attended. I also learned to bring along things that might be helpful, like props, a camera, and business cards. I can’t tell you how many opportunities to connect that I’ve had over the past few months and have been without a business card, because I didn’t think ahead. Some of the guys brought along Bond related props, which really added to the event. Note to self… Create an event checklist and go over it with other people. Always have business cards with you. You Need to Team Up With Someone That Has Different Skills Than You Do. While Marie is the confident networker, Steve is more of a deal maker. He knows the technical aspects of many projects and knows how to organize events and set schedules. Steve and Marie make a great team. While Marie may ask you to do something, Steve will be there to help you get it done. This event would not have been possible without Steve and Marie working together. Finding someone that you can work with is key. Overall. I had an amazing time at this event and made a lot of new connections. I came away with some awesome pictures and some new business opportunities. I want to personally thank Steve and Marie for putting this on. I now know what it is like to work with a true connector. I can’t wait for the Fashion Show.